Traditional catches for fastening sliding sash, casement and fanlight (transom) windows do not give much protection against forcing or slipping the catch from outside. Also, in many cases the catch can be easily undone if a burglar puts his hand in through nearby broken glass or an open fanlight. Window locks are designed to prevent this happening. Windows and frames vary a lot, so check that the lock fits your frame type and size. If necessary, take measurements or a sketch to the shop. Your local CPO may also be able to help. Most of the common types of window lock are shown opposite. The method of fitting window locks varies from type to type, from brand to brand and is different for metal and wooden windows. Many are fitted simply by screwing the lock body to the window, but some are mortised in. Striking plates may have to be mortised into the frame, or holes (sometimes tapped ones) made in the frame to take the lock’s bolt. Always make sure that you drill holes of the right size – sloppily fitting locks are not secure. The window and its frame should be sound as some locks could be ineffective on ill-fitting windows. Drill out or burr over the slots of fixing screws which are still accessible when the lock is locked. Most window locks are opened by keys one which docs not have a key will not be much use next to glass which can be broken. Keys are not always needed for locking this may be done by pushing a lever or some other part of the lock. Window locks seldom have key differs instead there is one universal key which fits all locks of the same model. Often the key is sold separately, so that you can have one key which will operate the locks on a number of your windows. Some brands have interchangeable keys for a number of different locks. With some locks it is possible to leave windows locked open to provide ventila­tion while you are out for a short while. It is probably best to lock windows closed when your house is going to be empty for any length of time. This sort of lock can also be used to secure upstairs windows in homes with children to reduce the likelihood of them opening the windows and falling. The Table indicates how obtrusive the locks appear when seen from indoors and how noticeable they are from outside which might put a burglar off. A really determined or fairly skilled burglar could probably defeat most of the usual window locks. The Table gives a verdict on the security of each type of lock based on the likely attack of an opportunist unskilled burglar. Certain types of windows are particularly difficult to secure satisfactorily without taking extreme measures. All problem windows can be made secure by fitting a metal grille or bars across them. Thick laminated glass can be used in some windows but it is expensive. Wired glass docs not provide much protection against break-ins, but double glazing can make homes more secure. These should have a good overlap between the two sides (called leaves). Fit mortise rack bolts or locking bolts top and bottom to both leaves of wooden-framed French windows. Shoot the bolts upwards and downwards into something solid which will resist forcing. 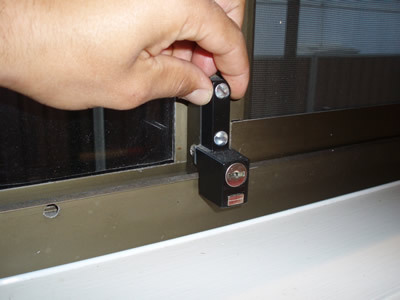 Use locking bolts on metal-framed windows. The only effective way to protect these is to fit a metal grille or bars behind the window. Some are now made with the glass secured in the frame. If not, glue the glass into both sides of the frame using a glue such as Aralditc. Even so, louvred windows are not really secure and if they are in a vulnerable place the ground floor at the back of the house, say they may need further protection with a metal grille or bars. Overall, it is best to replace insecure louvre windows. There are specially made locks available for these: make sure that the lock fits the window or door (not all locks fit all sections of the window or door frame).